Only two of the former six platforms remain in use. 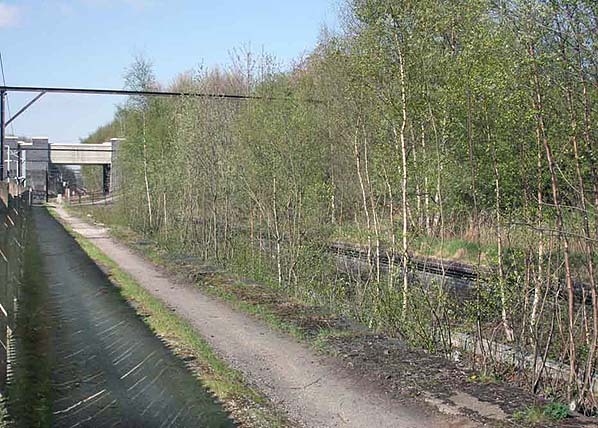 The westbound 'Fallowfield branch' platform has gone; the eastbound platform still exists, but disused and overgrown by vegetation. Some derelict brickwork remains at the west end of the station, this is a residue of the former entrance to the westbound Up Fast platform and the eastbound branch platform. Notes: Notes: Fairfield Station was opened by the Manchester, Sheffield & Lincolnshire Railway (MSLR) on the 17th November 1841. 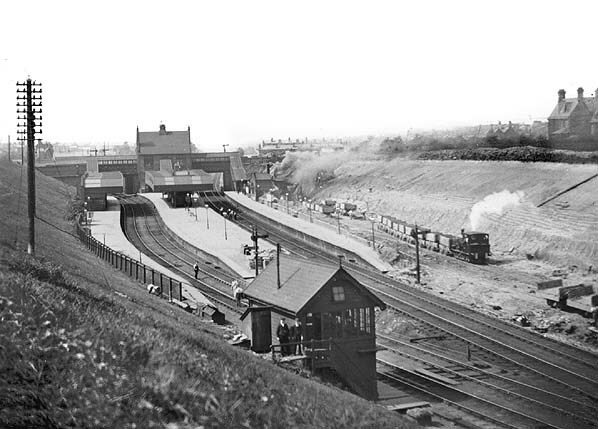 The station was situated on the MSLR’ main line between Manchester and Sheffield via Woodhead. station at Manchester London Road. However when the Cheshire Lines Committee, of which the MSLR was a constituent part, opened Manchester Central station in 1880 the MSLR wanted to make a connection to the new station. line. In 1897 the MSLR became the Great Central Railway (GCR). On 2nd May 1892 Fairfield was resited 374 yards to the east. In 1904 the GCR widened its main line through Fairfield from two tracks to four. The station was enlarged again. In its final form it had six platform faces, four of which served the main lines and two the Fallowfield Loop. By this time Fairfield was served by a local stopping service’s that ran between Manchester London Road and Glossop and Manchester Central and Guide Bridge. A steady stream of express services passed through the station on all of its lines. In 1923 the line became part of the LNER. British Railways network in 1948. In 1954 the Woodhead route between Manchester and Sheffield was electrified. 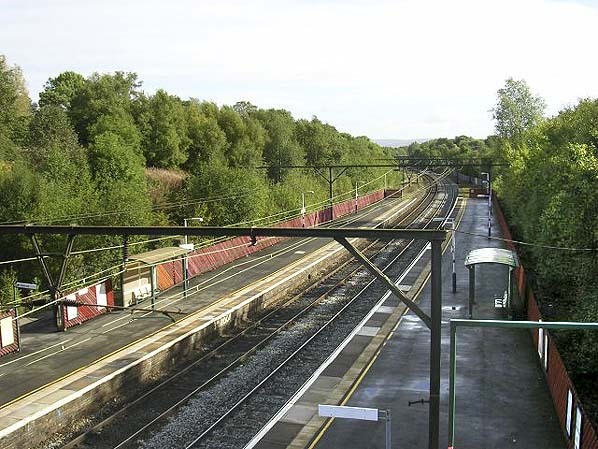 Consideration was also given to electrifying the Fallowfield line as it seemed sensible to continue the electrification through to Manchester Central. 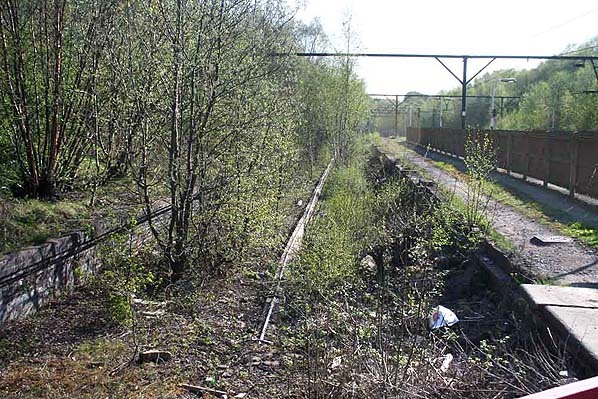 As things turned out only a short section of the line, between Fairfield and Reddish, were a new Motive Power Depot was opened, was electrified. until 1969. After that date it was only goods services that passed through. Reddish Depot closed in 1983 and the last goods services used the line in October 1988. 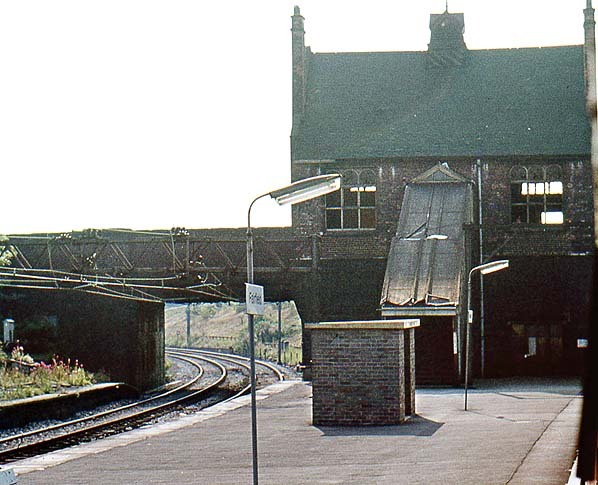 In 1981 the through route to Sheffield, which had only been used for goods services after 1970 closed to the east of Hadfield. Today Fairfield Station has reverted to a two platform station served by regular electric trains running between Manchester and Glossop and Hadfield. central (in this picture) platform. Fairfield Station looking south west along the Fallowfield loop line in August 1974. A covered footbridge extended from the left side of the building across the track to give access to the southbound platform. 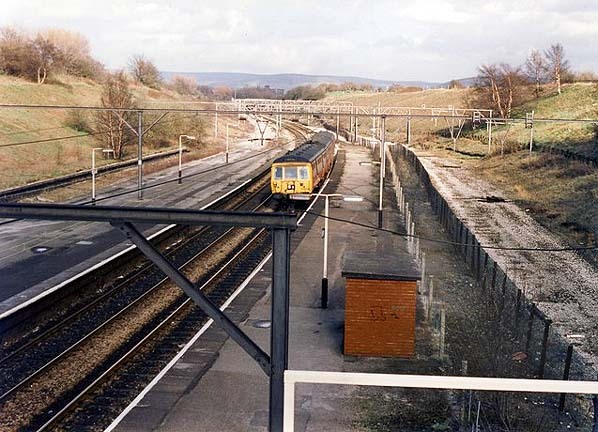 Fairfield station looking east in March 1989, the Fallowfield loop line (right) has recently been lifted. The two platforms on the left are also disused by this time. Fairfield Station from the same viewpoint as the picture above in September 2005. Note the brick platform shelter has been replaced by a bus shelter.